Carroll said the move happened so quickly that he didn’t get a chance to talk to Daniels before he left for Houston. RENTON — B.J. Daniels has been something of a security blanket for the Seahawks the past two-plus years, serving a variety of roles on the practice squad and increasingly this season on the active roster. But the Seahawks saw Daniels snatched away in the middle of the night Sunday by the Houston Texans, who officially signed him Monday as a backup quarterback after losing quarterback T.J. Yates to a knee injury. Carroll said the move happened so quickly that he didn’t get a chance to talk to Daniels before he left for Houston, which leads the AFC South at 7-7. “We didn’t even see him; this thing happened so fast, and he was gone,’’ Carroll said. The Seahawks first signed Daniels, who was a four-year starter at quarterback at South Florida, in October 2013 off waivers from the 49ers, and he was on the active roster for five weeks that season as the team’s No. 3 quarterback without playing. Daniels spent the 2014 regular season on the practice squad, serving as not only a scout-team quarterback but also a defensive back and receiver. He was signed to the active roster for the NFC title game and the Super Bowl (though he didn’t play in either game). The Seahawks converted Daniels to receiver in the spring, though also still playing him some at quarterback and on special teams, in coverage roles as well as listing him as a backup return man. Daniels made the initial 53-man roster this year due in part to a solid performance at quarterback in the final exhibition game. But Daniels twice was waived and re-signed to the practice squad and then signed again to the active roster before finally being waived a third time last week and again signed to the practice squad. Players can be signed to a team’s active 53-man roster off another team’s practice squad at any time. The Seahawks, though, had taken steps the past few years to persuade Daniels to hang around despite the constant roster shuffling — last year, for instance, the team raised his salary from the practice-squad rate to the active-roster rate (or from $6,300 a week to almost $30,000 a week). Daniels played in six games this year, making two catches for 18 yards and one tackle on special teams. 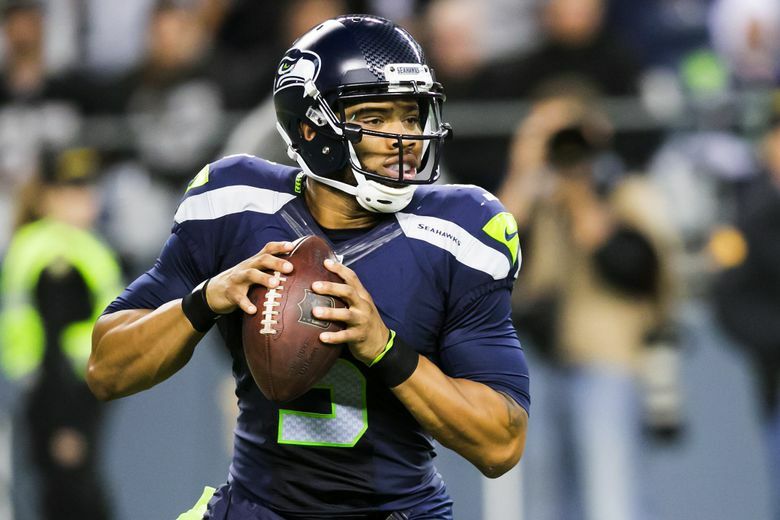 Carroll said the team could look to sign another quarterback to the practice squad — Russell Wilson and Tarvaris Jackson are the two QBs on the active roster. Daniels could be Houston’s backup QB this week behind Brandon Weeden with Yates out and Brian Hoyer still going through the concussion protocol. The waiving of Daniels last week left the Seahawks with just four receivers on the active roster — Doug Baldwin, Jermaine Kearse, Tyler Lockett and Kevin Smith. Former University of Washington and Skyline High star Kasen Williams and Douglas McNeil are the two receivers on the practice squad. • Carroll said initial evaluations of a calf strain suffered by left tackle Russell Okung did not show significant damage, though he said it remains unclear if he will be able to play Sunday. Alvin Bailey filled in when Okung left in the third quarter. • Carroll said strong safety Kam Chancellor, who sat out Sunday’s game because of a pelvic injury, was moving around better Monday but he added that it’s unclear if he will be able to play against the Rams.